At the onset of fall with brand-new fashion drops arriving in stores from the runways every day, I find myself grappling with how to approach dressing for the season ahead. My style is generally rooted in classic items with a mix of basic and investment pieces, yes. But there are also lots of bright, shiny trends right in front of me that I can’t help but consider. Crystal-adorned shoes, cowboy boots, puffed-up ’80s sleeves, wild animal prints like tiger and zebra—I could go on. It can honestly be overwhelming trying to figure out what to incorporate into my wardrobe, as I walk the line between embracing new fashion-forward trends and remaining true to my personal sense of style. After years of experimenting, though, I’ve learned the best lesson is to work in pieces in small ways and look back to my personal fashion muses for a little guidance. Notably, Carolyn Bessette-Kennedy. Scrolling through some of her best fall style moments, it instantly reminded me of the value of building a wardrobe that is trend-cautious. Her fall looks are centered around simple silhouettes and neutral colors like black, white, and tan—but she has small nods to of-the-moment trends that make them feel current. She would wear classic slip dresses and crewneck sweaters on rotation, but she would also mix in oval sunglasses and jeans with a subtle flare that completely captures the best of the ’90s trends. The lesson here is one I always come back to: Build your outfits around pieces that feel core to your personal sense of style that you’ll feel good about wearing years down the road, but also mix in a few trend-forward items to keep them modern. 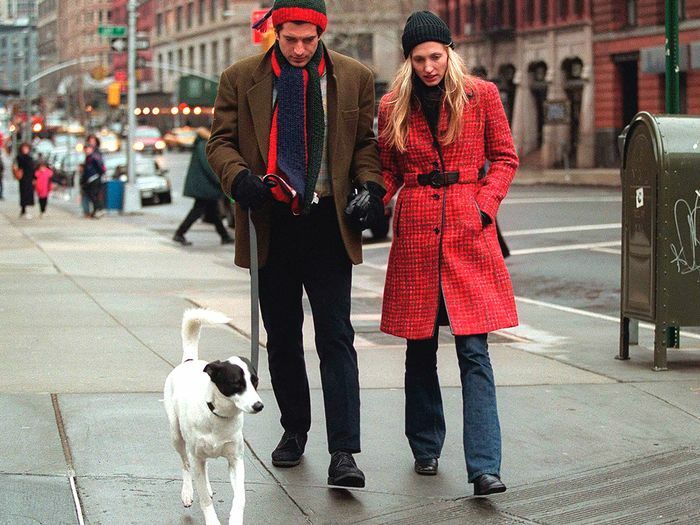 Ahead, I’m breaking down Carolyn Bessette-Kennedy’s best fall outfits and why they’re so inspiring. What really amazes me is her dedication to just a few colors. Black, tan, white—and the occasional pop of red—are what make up most of her wardrobe. Available in British sizes 6 to 16. Black can often be seen as “boring,” but she proves it’s all about the layering and textures—like the combination of her shiny headband, wool coat, and suede boots. One lesson I learned when living in NYC was to invest in a great coat. One of my friends even called it their “NYC car” since it’s what they were always traveling in. CBK knows this all too well. Available in Italian sizes 34 to 48. Like I mentioned, her neutral outfits are rarely punctuated with color, but when they are, it’s usually red. I often find dressing for a night out during the fall to be a challenge, but CBK demonstrates easily that a slip dress with an overcoat and pointed slingbacks is foolproof. Jeans and a T-shirt make for an outfit that’s about as simple as it gets, but I’m really drawn to the subtle flare of her jeans that pair perfectly with ankle boots. Next: Five ways to master NYC-girl style.